Comic books, as any enthusiast of comics books won't hesitate to tell you, have a long and robust history, one that extends far wider and deeper than the 20th-century caped musclemen, carousing teenagers, and wisecracking animals so many associate with the medium. The scholarship on comic-book history — still a relatively young field, you understand — has more than once revised its conclusions on exactly how far back its roots go, but as of now, the earliest acknowledged comic book dates to 1837. 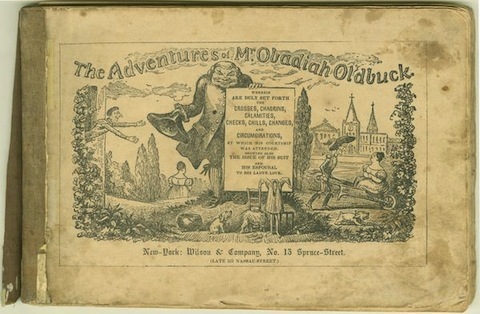 The Adventures of Obadiah Oldbuck, according to thecomicbooks.com's page on early comic-book history, "was done by Switzerland's Rudolphe Töpffer, who has been considered in Europe (and starting to become here in America) as the creator of the picture story. 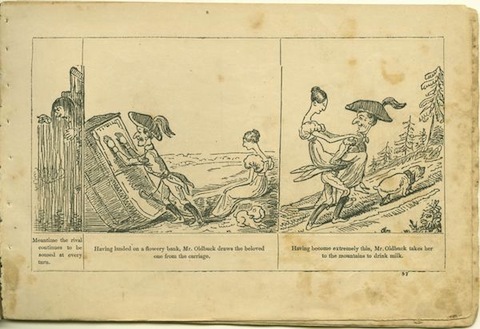 He created the comic strip in 1827," going on to create comic books "that were extremely successful and reprinted in many different languages; several of them had English versions in America in 1846. The books remained in print in America until 1877." Also known as Histoire de M. Vieux Bois, Les amours de Mr. Vieux Bois, or simply Monsieur Vieuxbois, the original 1837 Adventures of Obadiah Oldbuck earned Töpffer the designation of "the father of the modern comic" from no less an authority on the matter than Understanding Comics author Scott McCloud, who cites the series' pioneering use of bordered panels and "the interdependent combination of words and pictures." You can see for yourself at the web site of Dartmouth College's Library. Alas, contemporary critics — and to an extent Töpffer himself, who considered it a work targeted at children and "the lower classes" — couldn't see the innovation in all this. 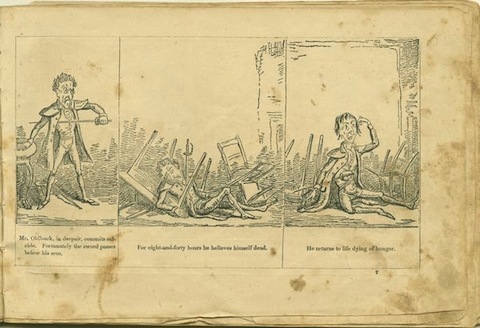 They wrote off Obadiah Oldbuck's harrowing yet strangely lighthearted pictorial stories of failed courtship, dueling, attempted suicide, robbery, drag, elopement, ghosts, stray bullets, attack dogs, double-crossing, and the threat of execution as mere trifles by an otherwise capable artist. So the next time anyone gets on your case about reading comic books, just tell 'em they said the same thing about Obadiah Oldbuck. Then send them this way so they can figure out what you mean. You can read The Adventures of Obadiah Oldbuck in its totality here. Wow! This is a great resource/blog! Thank you! The comic book pictured is a coverless 2nd printing of the USA WIlson & Co NYC edition from 1846. The FIRST USA printing was Brother Jonathan Extra #9 Sept 14 1842 being Mad magazine size 6 to 12 panels per its 40 pages wrap around using string for binding being as staples were not yet invented. The data in this “article” is completely mixed up. Sorry. Please re-edit and re-write. What was the first COLOR comic book or strip?